Categorized as: Stories on February 14, 2012. Trekking through India for three weeks to meet the clients of two of our most innovative partners—Upaya Social Ventures, providing steady jobs for the ultrapoor; and Freedom from Hunger, providing health protection via microfinance networks—we found more than thriving families. We discovered a country full of love. 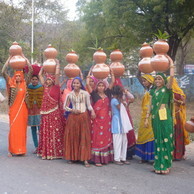 Hindu bachelorette party singing and dancing their way down a country road in Rajasthan. Many of us have an irrational affection for someplace far from our country of birth: Italy, Polynesia, Greece. For me, it’s always been India tugging at me, with its delicate designs across explosions of color, succulent stews and steaming chai, rollicking myths and infinite pantheon. This is where people prove their love by building massive tombs for their dearly departed: the renowned Taj Mahal is just one of many. According to the New Yorker, 99% of marriages are still arranged by family, and couples firmly believe love can bloom in any willing heart. Just back from my second visit to India (the first was to sample its temples and cuisine), this time I found a few surprises that escaped me when here as merely a tourist. Because our partners work in rural areas, the most challenging places to reach the poor, we had little access to Internet and even less to television. When we did have Internet, it just looked like chatter on the same few topics. When we did have TV, I found only local news, soap operas, and chanting monks. Eventually, I let go and let myself be where I was . . . a key tenet taught by a local guy named Siddhartha, whose Buddhism has been exported all over the world yet barely remains at 3% here, a minority against 80% Hinduism, 13% Islam, the remaining Christian, Sikh, or other. In this subcontinent one-third the size of the U.S. with almost four times as many people (1.23 billion compared to 330 million), I expected to find humanity shoved shoulder-to-shoulder and zany traffic of all types: pedestrians, bicycle rickshaws, auto rickshaws, and blaring zigzag cars. (In India, leaning on your horn is considered courteous.) On Republic Day, January 26, I ventured into an enormous shopping mall in Delhi to replenish my supply of mouthwash, and limped out two hours later clutching that one item in my paw, weary from swimming with the masses yet triumphant in that simplest of errands. Puchka (stuffed pastry) making is a family affair for microcredit client Golapkhuntia and her men. Their eldest son was at school the day we stopped by to try our hand at rolling dough-balls. What did not surprise me was the level of dedication on both sides of our partners’ equations. Having interviewed staff and clients extensively, I’ll spend the next weeks drafting profiles of nonprofit adminstrators who think nothing of trudging through country shacks all day gathering feedback from the clients they serve, balancing budgets past midnight, and answering U.S. emails at 5 a.m. My notebooks also bulge with details of clients born into nothing who are busy working their way into lives of choice: a husband-and-wife sculptor team who create elaborate statues for an endless parade of puja festivals; a 40-year-old woman with her first job as a health volunteer bringing medicines and advice to her village neighbors; and a 60-year-old widow who saved for 13 years to build herself a sturdy brick house where a mud-and-straw hut stood just a few months ago. Everywhere I went, I saw the mission statement of the Skees Family Foundation proved out: Given half a chance at opportunity—whether in enterprise, education, or health—people on either side of the world will work hard to provide for their families and change their destiny. Bhramar and Anima work as a team building clay sculptures to sell for religious festivals. Each statue takes abount one month to complete. Their 15-year-old son Sourav plans to attend college and become a policeman. What I did not expect to find was the exuberant kind of love that pervades this country. You notice it in the villages, where women and children greet you with clapping and song, men salute you with the blast of a conch shell, and everyone stops whatever they are doing to give you their undivided attention. Nestled close together in a credit meeting, they do not bristle with irritation as we would on a New York subway. As one man chuckled, “there is no privacy in India, because you are never alone.” For me and many Americans I know, we need quiet time, personal space, and things our way. There is no such reality in this land of endless humanity, yet people seem serene. What surprised me went far beyond resilience. It was not exactly passivity. Did Indians not notice that most of their country still lacked electricity, plumbing, clean water, jobs, quality schools and accessible healthcare? When we drove past town after town of monotony in our air-conditioned Toyota Tata tourist van, we could easily have grown bereft over the millions of children not in school, women lugging pails of hand-pumped water, men sitting in trios on their haunches. We could drive for days across bumpy unpaved roads with the scene never changing, and then escape into our comfortable hotels or flee on the next flight home. Just one of the many families who befriended us on our walks through northern and eastern India. However, because of our chance to work with local partners deeply connected to families on the ground, I got off the tourist track and discovered the heart of India. While philanthropy at the highest levels of new wealth is still underdeveloped here, I found ordinary people gladly sharing what little they have. Goat-farmer Saraswati, named after the goddess of education and wisdom, lives on $1.25/day yet insisted we take tea and snacks in her little thatch-roofed courtyard. Credit-group president and volunteer health-instructor Mohini invited our group into her family kitchen for the freshest homemade puchkas and samosas (vegetable-stuffed pastries) that we’d ever tasted. And everywhere we went, people freely shared their handshakes and hugs, smiles and small-talk, with an innocence that says, we like you because you exist along with us. We are in this life together, and so we love you. The Americans with whom I traveled, like me, grew travelworn and overwhelmed. We all suffered maladies of the stomach and head, and we all felt the miracle of clamboring onto a machine that would fly us 8,000 miles home to our lives of comfort, infrastructure, and choice. However, like me, they may always hold a place in their hearts for the love of a people so eager to give affection undeserved, a bright smile, and a good hot cup of chai. Stay tuned for more stories of trial and error, scaling and success, on the programs in India by Freedom from Hunger and Upaya Social Ventures.